Learn how to use a WinJS.UI.Pivot control for layout and navigation in your Windows Phone 8.1 app. The Pivot provides a quick way to manage, present, and quickly navigate through sections of content in your app by panning left or right—continuously wrapping like a carousel. Use it for filtering large datasets, viewing multiple data sets, or switching app views. Also, you can see the Flat navigation and Hierarchical navigation patterns in action as part of our App features, start to finish series. You can also use the Hub/Pivot App (Universal Apps) template to create a Universal Windows app. 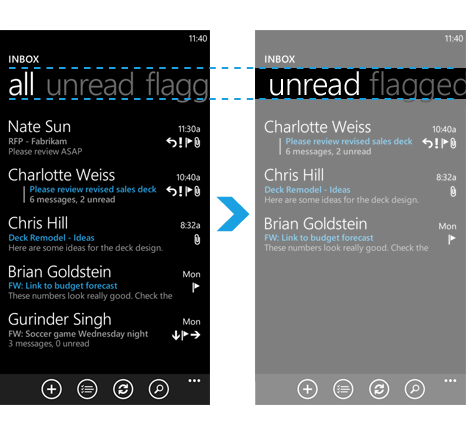 For this example, we'll use the Pivot App (Windows Phone) template. Start Microsoft Visual Studio 2013 Update 2. Choose File > New Project or click New Project from the Start Page tab. The New Project dialog box opens. 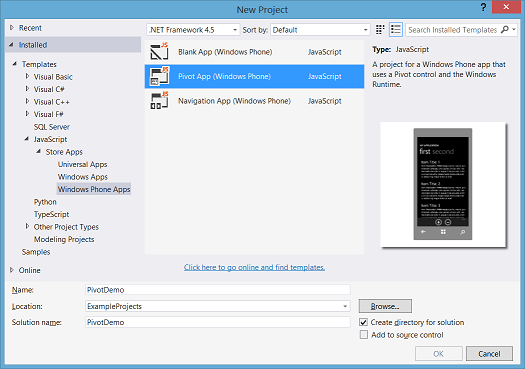 In the center pane, select the Pivot App (Windows Phone) project template. In the Name text box, type a name for your project. The examples in this topic use PivotDemo. Each section within a Pivot is defined by a PivotItem control. The template includes four demo sections that you can modify or delete, as required. Here we'll show you how to add a fifth section. The base file structure of the template looks like this in Solution Explorer. Note For consistency with Universal Windows apps, the template uses the hub-section-detail/item model of the Hierarchical navigation pattern for the file naming convention. 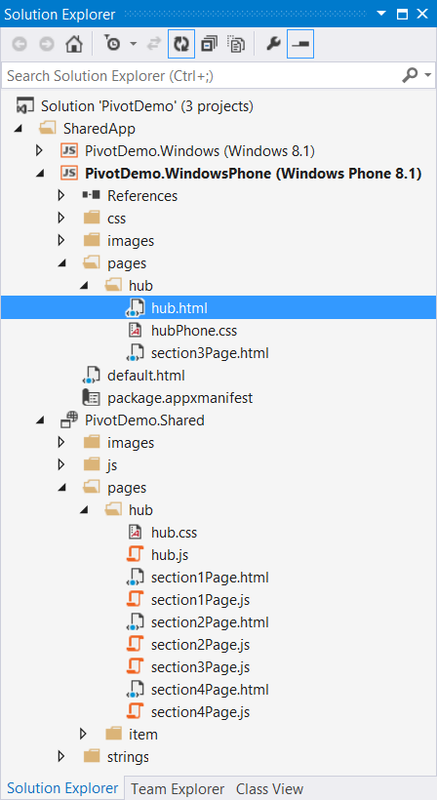 The Pivot and each PivotItem are declared in hub.html in thepages\hub folder. Here, the template includes a single Pivot control (hub) with four PivotItem controls (sections) that contain both static (section1, section2, section4) and data-driven (section3) content. Declare additional pages by simply copying and pasting one of the existing sections. Modify the new section specification as required. Here, we declare a fifth section based on section4. For our example, we add section5Page.html and section5Page.js to the pages/hub folder. section5Page.html—specifies the content of the section. 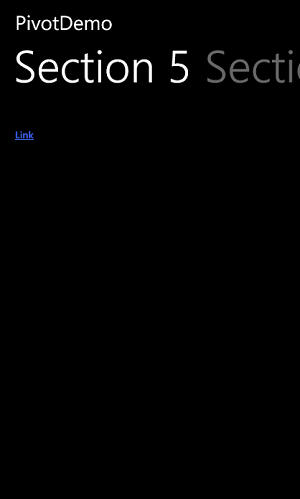 Here, we just display a text link to an item page. The header strings for each section are defined in resources.resjson in the strings/en-US folder. Here, we add another name-value pair for Section 5.
section5Page.js—specifies behavior that's associated with the section. Here, we call a basic ready function for the page and expose the section5Page as a custom control for display on the hub. We also have a click handler for the text link that initiates the navigation to an item page. // Retrieve the page 2 link and register the event handler. // page; use a link instead. 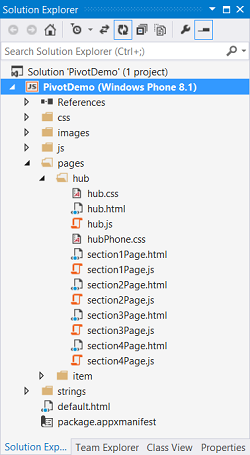 A reference to section5Page.js must also be added to hub.html in the pages/hub folder. Run the app. Choose Debug > Start Debugging, or choose F5 (choose SHIFT + F5 to stop debugging and return to Microsoft Visual Studio). Here is a screen shot of the Phone app with the new section. Use the Hub/Pivot App (Universal Apps) template to create a Universal Windows app for Windows and Windows Phone. Start Visual Studio 2013 Update 2. In the center pane, select the Hub/Pivot App (Universal Apps) project template. In the Name text box, type a name for your project. Your new Hub/Pivot App solution contains three projects. One for Windows-specific files, one for Phone-specific files, and one for code that is shared. Set the StartUp Project to Windows or WindowsPhone project, as required for testing. 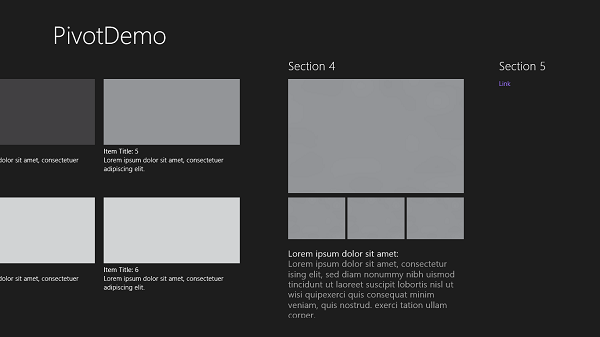 As in the Pivot App (Windows Phone) template, the Hub/Pivot App template includes four demo sections that you can modify or delete, as required. Run the app. Choose Debug > Start Debugging, or choose F5 (choose SHIFT + F5 to stop debugging and return to Visual Studio). Remember: Set the WindowsPhone project as the StartUp Project. And here's a screen shot of the new section in the Windows app. In this quickstart, you reviewed the Pivot App (Windows Phone) template and the Hub/Pivot App (Universal Apps) universal template included with Visual Studio 2013 Update 2. You added a new section with the PivotItem control and a simple handler function for the click event on the text link included in the section content.